Coccydynia is a word that literally means “tailbone pain,” and there are several causes. 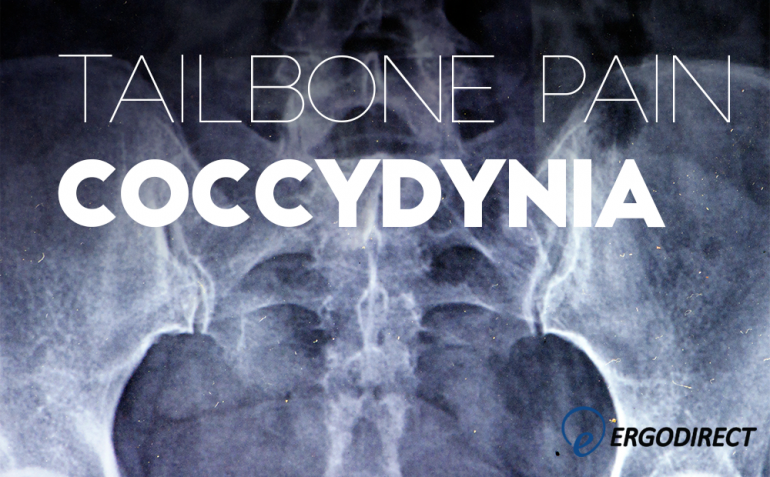 Usually, there was a prior injury to the tailbone, like a fall sitting onto a hard surface. The pain could have started right at the time of the fall, or the problem could slowly progress to become painful months or even years after the event. Very often the spinal joints above (at the lumbar spine) can refer pain down into the tailbone, or the ligaments that attach to the tailbone can become irritated. Either way, the tailbone is usually painful to direct pressure at the end of the spine. People may slump way down in the chair to move the pressure to the back of the pelvis (onto the sacrum). Unfortunately, that posture puts the lower back into more forward bending, and may worsen symptoms later. 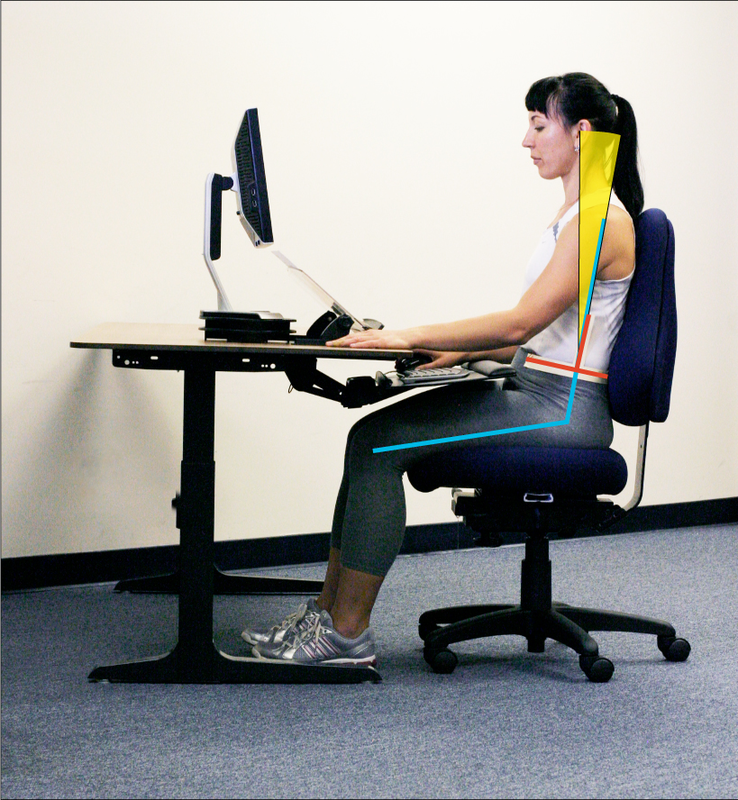 Standing can relieve pain by eliminating the tailbone pressure from the chair and possibly improving spinal posture. Regular standing is not a completely desirable solution either—medical studies on increased standing at work report greater risk factors for atherosclerosis and heart disease(1,2). Standing and walking the greater part of the day will also nearly double the likelihood to be hospitalized for varicose veins(3). A recent study showed surprising improvement in productivity and a significant improvement in neck and low back symptoms with very little standing—using work-break software for brief posture changes made a significant difference whether people used a sit-stand workstation or a conventional sitting work station(4). How we sit in the chair makes a big difference for how the whole body works, and it’s smart to look more closely at sitting posture. 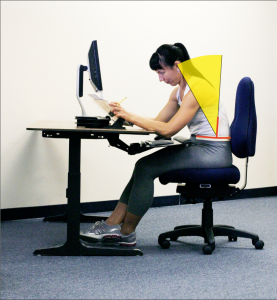 Chairs that only lean backward may not be best when work moves the body forward. Photographs 1 and 2. The left image shows the reclined sitting posture with good spine posture and low disc pressure compared to standing. The right image shows the same chair adjustment, but when the body moves forward the spine bends into the very worst posture, nearly doubling disc pressures in the low back, and increasing risk of long-term spinal problems. Sometimes people will try to sit well even if the chair does not support them. Perched posture (Photograph 3) is an easy way to sit upright in a chair that only leans back, but imagine what that posture will do to tailbone pain! A chair with a forward tilt (Photograph 4) may support good spine postures better when the work is forward, because the pressure is carried through more of the thigh while the spine is upright. Photographs 3 and 4. The left image shows the “perched” sitting posture when the user chooses good spine posture, but works harder without back or leg support. 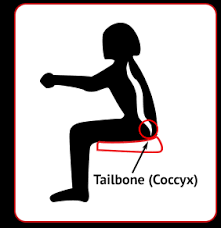 Can that posture be a cause of tailbone pain? The right image shows forward work with the balanced spine actively supported by the legs, full thigh support on the chair, and the work surface provides full forearm support for forward tasks so forward, upright sitting postures are easier. 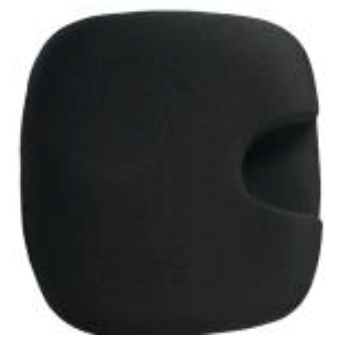 Some chair manufacturers, like Office Master, have chairs with fully adjustable seat pan angles, and there are options to modify the seat pan (UPHCYX-CC) with a cut-out in the upholstery to relieve direct pressure on the tailbone. Interestingly, the wedge cushion also helps move the body forward like the seat pan tilt mechanism in some adjustable chairs to relieve forward bending on the lumbar spine, which is the common problem for sitting. There’s something wrong if it hurts to sit. 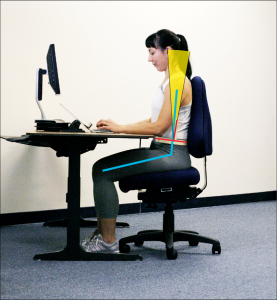 Looking closely at how the chair and workstation position the spine is an important component of a good ergonomic evaluation, and the solution should offer relief. Even a perfect workstation may not resolve the problem, and a medical professional like a doctor or physical therapist should be able to offer effective treatment when there is a simple mechanical cause. 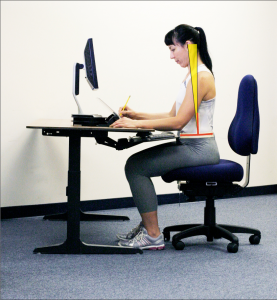 ErgoDirect’s opinion : Prolonged standing is as bad for health as prolonged sitting. Alternating regularly between both these postures is recommended. The frequency of alternating between sitting and standing should be determined individually based upon the nature of your work, body type, medical conditions, if any and professional ergonomic opinion. Krause, N, et al, (2000). Standing at work and progression of carotid atherosclerosis. Scandinavian Journal of Work and Environmental Health 26, 227-236. Love Your Ergotron WorkFit-T? Want to Make it Even Better?